Mum's calling : Keen on Adult Ballet? What do you do during your 'me time?' For the past few weeks, I managed to find some time to fill in a little workout every Friday morning. I did adult ballet! Yes, I have a special love for it since I was young. Never too late to learn. And nah, I'm only a beginner at it. I did try to pass on my passion to Jazz, but she wasn't keen. What made my commitment possible was signing up with a friend and paid for a number of sessions. Totally no reason to procrastinate or get lazy about it. My friend did the research of schools, and I tagged along. It's not easy to find a suitable time slot for stay home Mums to do a class. What we barely have on hand, is time when the kids are in school. We chanced upon M.A Ballet and thought it was perfect for being centrally located with a Friday morning time slot. We did a trial, decided it was our learning pace and went on to sign in 10 lessons. So you know, it's not a sponsored post or paid review. 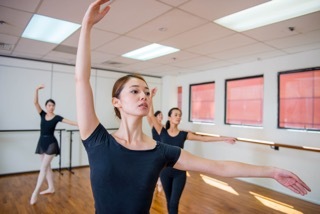 Our instructor, Mayu is a professional dancer and teacher with much awards and accolades under her belt. Having been teaching here for the past 6 years in Singapore, she often acclaims she's more of a Singaporean than Japanese. Her passion for teaching is much displayed during our lessons, when she would spend every effort to explain and correct a move. It's true, ballet is not without fret. From the slightest breath to the smallest body part, they make up a team. It's much work within a simple move. I often spot myself tangled in the various moves and sequences, but I will say practice makes perfect. It's always a great workout at the end of each session. Mayu conducts children classes too, but does not sit them for exams. She believes in learning for passion and joy without the stress of going through examinations. This is what some parents firmly believe in. So yeap, if you haven't tried an adult ballet class, I'm here to notify you that M.A Ballet is conducting free adult trial class at the moment. You will have to hurry, before they decide to end the free trial. Also, if you're keen to further your lessons with her. You may quote that you read about her on my blog for the waiver of registration fee (till 31 Dec 2015).